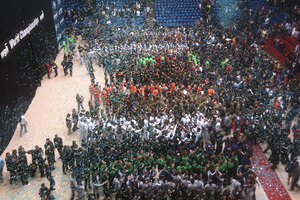 the finale of last Saturday's WGI World Championships. This past weekend's Winter Guard International (WGI) Percussion World Championships in Dayton, Ohio, featured several winter percussion lines that are connected to Drum Corps International organizations. On April 17, at the University of Dayton Arena, many of these lines did quite well at the Independent Open and World Class Finals. In the Independent World Class, the Blue Knights Percussion Ensemble finished in 10th place with a score of 86.888. The line has long been a successful training ground for prospective future members of the corps, but has also served as an outlet for any youth who wish to participate, regardless of their interest in marching in the organization's drum corps during the summer. In the Independent Open Class, OC Indoor, the winter line of the Oregon Crusaders, scored 93.075 in the Finals for third place which was only 0.788 from the winning score. Green Thunder, a training unit for the Cavaliers that teaches many members from scratch, scored 85.225 for 11th place in the Finals. In addition, Pioneer Indoor competed in the Open Class Prelims. Of special note is "Meet Green Thunder," a video now offered on the WGI Fan Network that was produced in Dayton this past weekend. Watch the Green Thunder video on the WGI Fan Network. Learn more about the results of the WGI Percussion World Championships at WGI.org.